Cook pasta according to directions. Drain. Keep warm. Meanwhile, in skillet cook garlic and basil in oil. I minute. Reduce heat, add cream cheese, cottage cheese, and parmesan. Heat and stir until smooth. Stir in wine, parsley and water. Cook uncovered 3 minutes or until slightly thickened. Serve sauce over hot cooked pasta. Decorate with fresh basil. Low in fat and calories! This is a recipe for an Italian meat sauce that simmers for several hours before it is ready to serve. 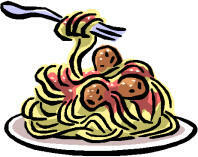 We serve the spaghetti topped with fresh parmesan cheese, and sometimes sautéed fresh mushrooms. A crisp salad and a loaf of garlic bread hot out of the oven is all you need for this family pleasing meal!